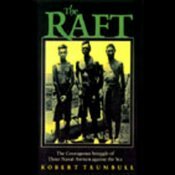 The Raft is a terrific survival tale, detailing the 34-day ordeal of three airmen whose plane came down in the Pacific during World War II. A while back I got an email from the son of one of the men thanking me for narrating the book. I'd forgotten about it and had to check around to make sure it was still available. It's up on Audible and it's another one of those Blackstone titles recorded on cassette which have held up so remarkably well. 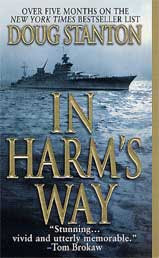 Along the same lines, I travelled to New York a few years back to record In Harm's Way, a chilling and somewhat grueling account of the sinking of the USS Indianapolis and the wretched experiences of the crew members who struggled to survive in shark-infested waters. Talk about Jaws--you'll have trouble enjoying the beach after this one. Unfortunately the audio seems to have disappeared. Perhaps the rights expired, I don't know, but it was a fine story and worth reading if you like survival and endurance tales.